LET ME BEGIN this review by stating three facts. Fact one: I don't like IBM-type PCs any more. I lost interest in the IBM PC-class machines over a year ago when it became apparent that OS/2 might actually be a real operating system. If it succeeded it meant that I might be forced - for the sake of future compatibility - to abandon my Compaq and PC XT with their combined 38Megs of information. To be honest, I also got tired of IBM tugging my lead, as it were, when it came to "Big Blue's" idea of standards. I just didn't feel like being at IBM's beck and call regarding my private computer parts. So I decided I'd keep my XT and Compaq as they were and move on to something that wouldn't force me to choose between OS/2 and MS-DOS or PSs and PCs. The release of the Macintosh II from Apple convinced me that the Mac was a system suited perfectly to my musical and literary pursuits. Fact two: I'm not the most ardent Yamaha fan. I could never separate DXs from TXs from RXs from T Rexs, and every piece of the company's musical equipment looked like it had been designed by Darth Vader - imposing, almost forbidding. Though Yamaha make great gear, I had the same feeling about it that I've had towards IBM PCs of late - as if I was getting enveloped by some corporate entity which, having sunk its talons into my life, would never let me go. Fact three: I think that almost anything - short of root canal work - is more interesting than specific computer hardware. Computers are computers are computers. Yes, some perform better than others, some fit certain requirements better than others, but in the long run, the computer is really only a function of the software that runs on it. Now, however, I have a major problem. The new C1 music computer from Yamaha may force me to change my mind about facts one, two and three - fast. But before we get too far into the technical make-up of the C1, let's just look at the computer - because it's certainly worth looking at. The machine is a little bit bigger than your standard laptop computer, more along the lines of the size of a portable typewriter. With dimensions of 15½" X 15" X 3¼", and a weight of only 18 pounds, 12 ounces, the C1 poses no problems in the transportation department - even your grandmother could haul this piece of kit around without too much effort - though that might be overestimating its appeal somewhat. True to form, Yamaha have employed their usual technokill design philosophy to the C1. Ordinarily that would be old news, but this time it works. I have never seen a more rad, cool, serious, dope, wicked, bitchin', tough or awesome-looking personal computer in my life. The design looks as if it might have been stolen off Pininfarina's drawing board - very sleek and very showy. It would certainly look the part on a concert stage and in a recording studio. I'm impressed. "The C1 boasts eight MIDI Outs, two MIDI Ins, a single MIDI Thru, SMPTE In and Out ports, an expansion card slot, two RS232 serial ports, and a printer port." 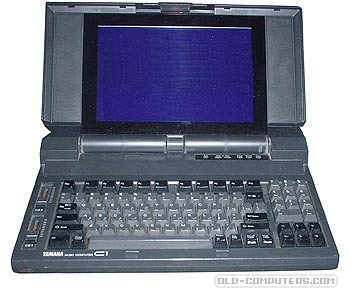 The computer features a fold-up monitor like those employed on laptop machines (but the system isn't a laptop, and requires continuous AC current, meaning it has to be plugged into the mains). The screen is a neatly-designed backlit LCD white field, with blue characters and symbols - no clunky gray liquid crystal job for this machine. The capabilities of the monitor compete with almost anything you'll find on a standard monochrome monitor in terms of clarity, resolution, and speed due to its 640X400 screen. And - excuse the aesthetic departure - it has the most appealing shade of blue you've ever seen. Really, this screen is a joy to look at. The keyboard, all in black, is designed to a fairly standard IBM 88-key ASCII configuration, but is a little cramped due to the width of the machine. The number pad sits on the upper right, while the function keys spread out horizontally across the top. On the left are two faders, labeled C1 and C2, which are the most obvious indication that this computer is not designed simply for word processing. Keys are marked white and laid out in the standard alpha-numeric formation with a bit of a twist: in gold under each letter is a musical symbol that can be employed in software applications. For example, a triplet symbol is found on the "T" key, F# is found on the "J" key, a whole note is found on the "Q" key and so on. The specific use of the individual keys, as well as the faders, is determined by the particular music software package that you're using. Lest you feel intimidated by such diversity on your PC keyboard, Yamaha have a software package called MIDI Monitor to help you keep track of all of these features. I'll touch on the software in a while. THE C1 COMES with a brief manual covering the functions of the machine, but it admits that it presupposes a certain level of MIDI literacy on the part of the user. Like most PC system manuals, this one is pretty blasé, and half of it is devoted to DOS functions. It is only 73 pages long, and not at all bad as far as manuals go. Although there is a twin floppy drive version of the C1, the system that Yamaha UK are bringing into Britain comes with a 20Meg hard disk, and uses the increasingly popular 3½" diskette format for its A drive. Although this is not yet standard procedure for DOS machines, it is for PS/2 machines, but don't be confused, because this is a DOS machine through and through. This was actually a wise move on Yamaha's part, because musicians are known to be overly rough on the bendable and easily mangled 5¼" floppy format. Now for some hardware specifics. The machine uses the Intel 80286 processor, which is mildly disappointing, given the fact that the new 80386 is becoming more common and is a much more powerful chip. The 386 also would have helped facilitate the speed and graphics capability of the machine that much more, but under the circumstances, I'm not going to complain. There's 640K internal memory so the computer will run any size DOS program, since (for the moment, at least) 640 is the DOS ceiling on applications. "Even though it's early days yet for the C1, a healthy number of software houses have announced their intention to port programs across to Yamaha's new computer." But the real hardware gems for you and I are the previously mentioned eight MIDI Out ports, two MIDI In ports, a single MIDI Thru port, SMPTE Time Code In and Time Code Out ports, as well as an expansion card slot, two RS232 serial ports, and a printer port. Enough of the right stuff to give you climactic MIDI experiences. All the MIDI ports, in particular, mean that you may not need to buy a MIDI patchbay or thru box. They also offer you the possibility of running several hundred MIDI channels at once. Of course it's up to the software developers to take advantage of these ports, but the potential is definitely there. MOST SOFTWARE APPLICATIONS that will run on MS-DOS 3.0 will also run on the C1, as long as you are using the properly configured 3½" format. Yamaha also provide a DOS 3.3 systems disk for the machine. But be aware that the C1 is not compatible with Roland's MPU-401 interface and software designed to work with it. At present Yamaha UK are still deciding what software will be included with the computer for its projected late December/January '89 launch on this side of the Atlantic. In the States, the aforementioned MIDI Monitor and a Bulk Manager accompany it. The first is a nifty package for managing the functions of the keyboard and faders (sliders), as well as "monitor" MIDI data flow. It consists of a number of fairly self-explanatory windows which show you where you are at any given point, and constantly keep you updated on fader and function key assignments. It even has a visual patchbay to keep you from really screwing up. The Bulk Manager is exactly what it sounds like - software for managing MIDI bulk data so that you can efficiently store, transport, offload or whatever your MIDI patches and other SysEx data. Of course the arrival of a new computer gives software houses the opportunity to port their existing software across to it - giving it support and themselves the chance of seeing more return on their investment. Even though it's early days yet for the C1, Passport Designs are intending to port Master Tracks Pro (available from MCM and Steinberg Digital Audio in the UK) and Score (from SDA in the UK) to it, as have Voyetra with their Sequencer Plus (from SDA and Audio Digital Technology in the UK), Turtle Beach with their S900 sample editor (from SDA in the UK), Dr Ts with their Soundquest range of editors (from MCM in the UK) and Bacchus with their sound editors (from ADT and SDA in the UK). "Keys are marked white in the standard alpha-numeric formation - under each letter is a musical symbol that can be employed in software applications." One other thing the C1 has going in its favour is the September announcement by American PC vendors Compaq, Tandy, Hewlett-Packard, and half a dozen others that they are going to confront the PS/2 architecture by banding together and maintaining the current IBM PC AT-class architecture. This should ensure a long and prosperous life for the thousands of software packages that IBM were hoping everybody would throw away with the introduction of the PS/2 and its Micro Channel architecture. It also means a new lease of life for MS-DOS machines and software. The C1 probably couldn't have appeared at a better time. NOW FOR THE C1's only major drawback: the price. Considering you can pick up an Amstrad PC for under £500 the C1 starts to look overpriced. So before you start quietly shaking your head or screaming, let me point out a few things. First off at somewhere between £2,600 and £2,700, its price is in line with a good number of the laptops currently on the market. If you want real portability and power, you've got to pay a premium. Secondly, this machine is very much a portable fully-specified MIDI system. You've got most of the interface options you're going to need, software, MIDI-specific features, and a very definite musician-orientation in one machine. For the money, you're getting a complete MIDI studio system and/or a MIDI performance controller in a package not much bigger than a briefcase. Think how much it would cost to put a MIDI interface, along with a few application-specific MIDI boxes (junctions, switchers, SMPTE converter et al) together. Given these features and the comprehensive functions of this machine, the cost really isn't out of line. It's just a little steep for the everyday user. SO HERE'S THE dilemma. Stick with the personal computers that lend themselves to music production from the outset (specifically Macs and Ataris), or switch back to DOS and the slickest machine to burn MIDI channels in years. Decisions, decisions. Chalk one up to Darth Vader for having created such an imposingly impressive computer. Technokill, indeed. Price C1 with 20 Meg hard disk: TBA (expected to be £2,600-2,700). Didn't know such thing existed, in 1989 (Atari ST and Amiga years). I'd be interested in its MIDI timing quality, with this very peculiar 2+8+1 MIDI/SMTP interface "not MPU-401 compatible". Last time I tested Cakewalk for DOS on an 90s laptop with my MidiGAL it wasn't that great. The Yamaha C1 was released in 1987 and is basically a 80286 processor based PC with 8 built in MIDI ports for use in applications where there are many MIDI instruments to address. By 1987 some machines which were capable of responding on multiple MIDI channels were appearing, and some earlier machines could only function in "omni" mode which meant that they needed a whole 16 channel port to themselves or they would play every time a note intended for another instrument was sent. Since MIDI information is fairly 'slow' in respect to what even a about 10Mhz computer can handle 8 output ports with buffers wasn't a difficult thing to pull off for even an old 286 apparently. Various DOS applications were included, among them the Voyetra Sequencer which was set up to run all 8 ports. I have the full Yamaha C1 Music Computer system with all peripherals. from the now defunkt Turtle Beach archive). I will make back-ups of all of the disks. It immediately reminded me of why hardware MIDI sequencers are king. More on it later, there is hope! if you wouldnt mind attaching the CAPI driver file here for my own records id appreciate it! CAPI? I got the VAPI and SAPI for the DOS based system MPU-401, C1, etc. But I did download most of the files I could get from turtlebeach archive at the time and I will post them all here. Don't hold your breath tho' my stuff is in deep hibernation / storage hehe but I am moving towards this! If I get a chance, I'll pop in and only fetch the floppies to make backups. Some of the original floppy image files I have on a Toshiba 480CDT which I used to move files between systems (along with a Toshiba USB flopyy drive for my MBP) -it will happen!! ps. 'pearce_jj' over at vintagecomptuerfederation has made an SSD/SD/CF daughterboard for the C1! I KNEW how incredibly rare they really are) and lo-and-behold I found a .zip file of all the peripherals for Voyetra Sequencer Gold Plus. Question is: where is it best to store this? *for the C1 I will make a defined package in the future, which has the/my instructions on how to sequentially load all drivers (including the MIDI and a mouse driver) and boot the C1 into Voyetra and start working. I just happened upon this thread somehow, maybe destiny? We are looking for a tester with a Yamaha C1 Music Computer to test the card that James (pearce_jj) designed for this machine. Would you be interested in helping us out?